The picture shown on the left was found among a number of WW1 pictures of soldiers and nurses at Ossett Library with the simple inscription "Mrs. Campbell - Nurse." No information has been located to determine where Mrs. Campbell undertook her nursing service during WW1, although it is highly likely. There is also some uncertainty regarding whether what follows is the history of the Mrs. Campbell in the photograph or whether it is another woman of the same name. What is known is that Mrs. Campbell in the photograph was a resident of Ossett at the time of WW1 and research has only identified one woman of that name living in Ossett. What follows is her story. Susannah Martha Campbell is the only woman with that name living in Ossett in 1911. Nothing has been discovered about her prior to 1911 because it has not been possible to discover any record of her marriage or of her maiden name. It is believed that she was born in Manchester in about 1885. In 1911 Susannah lived at 45, Westfield Street, Ossett with her husband, Leeds born James Campbell, aged 32, who worked as a Rag Grinder for a local woollen manufacturer. In 1911, they had, apparently, been married for six years and had child, James Edward Campbell aged 4 months. It appears that by 1913, the Campbell family had moved to Wesley Street, Ossett. 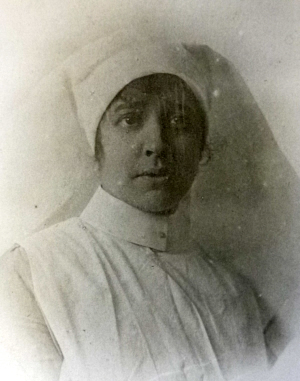 A biography of Nurse Norah Ward also appears elsewhere in this section of the website. Her Ossett address was 24, Westfield Street, which is situated almost opposite Susannah Campbell’s home address at 45, Westfield Street. It is quite possible that the two knew one another and perhaps worked in the same hospital? Unfortunately, service records for nurses in service during WW1 are incomplete, but Mrs Susannah Martha Campbell does not appear in those which are available online. It is, however, quite possible that her records do exist, but have not yet been made available online. If any readers have any information about Nurse Susannah Martha Campbell of Westfield Street and Wesley Street, Ossett, please help us to complete this tribute to her by contacting us.